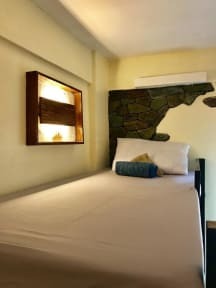 Outpost Beach Hostel i El Nido, Filippinerne: Reservér nu! BEST HOSTEL IN EL NIDO!!! There’s a different nightly event each night and it’s always FULL here so book a couple nights in advance or get a room if your lucky enough to be on the waitin list. This place is SOO much fun, friendly staff, awesome food, super clean bathrooms and brand new all air con and fan rooms :) you can’t ask for anything else from a hostel in the Philippines! Booked 1 night and extended to 8 in total. You will be a part of the outpost family when you arrive! Thanks OUTPOST!!! Really nice place and the staff was lovely. There was a littel to much party for me, but the music was turn off around 11 pm. Nice and clean place. Absolutely stunning sunset. The philipino staff was really Nice, and friendly. The White staff where on the other hand a bit to smart and rude. They did not respond properly to a question and turned us their back several times when we asked them a question. Outpost has the potential to be a great hostel. Unfortunately the staff and the atmosphere was a mixture of rude and arrogant. The service was not great and many times we were wrongly informed. Also the food was good but several times we waited for up to an hour before getting our food. 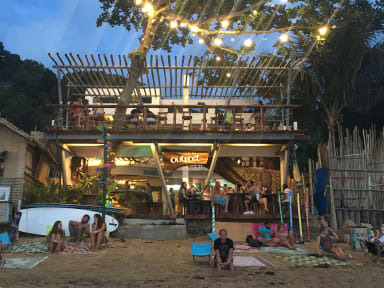 But there is great food close by- like sunset republican or happiness beach bar! Overall our experience was not the best. But non the less remember to always make your own experience.